Roasted garlic rosemary potatoes, a side dish after my own heart. Are you looking for the best side dishes for the Thanksgiving dinner or the best side dishes for the Christmas dinner? Well, here you have one of them. And if you want to take that Sunday roast to a whole new level, you need to follow a few, very easy steps which will guarantee a smashing success. These amazing potatoes go amazingly well with that succulent turkey or steak. Are you hungry yet? I am certainly almost drooling thinking of what a fine meal this is. I love potatoes, and there are endless ways of cooking them at home. Potatoes have been wrongly classified as bad boys because of the reputation take-away fries have. And indeed, those are bad, very very bad for one’s health. My heart aches when I see toddlers in fast-food restaurants given fries drenched in oil and burgers made of God knows what kind of meat. If one can call that meat. I know that time is precious and it is a lot easier to have a take away and sort the tea really quickly, but I would never ever give my little one that kind of food. Healthy habits are learnt from an early age, as later on it will be really hard to preach a healthy life style to someone who had unhealthy food as a child. And potatoes are healthy if you cook them the right way. For these potatoes, for example, I only used one tablespoon of olive oil, there is really no need for any more than that. So, anyway, back to our potatoes. I was telling you about how to roast the perfect potatoes. Indeed, nothing simpler. These are English style roast potatoes, so you can imagine that the recipe is fail proof. No one loves their roasted potatoes more than English people do. The pride of having the very best side dish cannot be described in words. First of all, pre-boil the potatoes for about 5 minutes. We do not want to boil them for any longer, otherwise they get cooked through, and that’s not what we need quite yet. After, drain the water, and really bash the potatoes together. Be rough, as those smashed edges will crisp up beautifully in the oven. Now, leave them to dry for a bit, let’s say about 5 minutes or so. Next, get that oven hot. Really hot!!! And heat up the oil before the potatoes go in the oven. Don’t worry about smoking up the kitchen, it really helps getting those potatoes right. If the rosemary survives well in the oven, the garlic won’t, so do not peel the skin off the garlic cloves, they will burn quickly and become bitter. Just leave them witht he skin on, the flavour will be released anyway. Easy, right? Once the potatoes are done, just gather the whole family together and enjoy, you are in for the best treat. 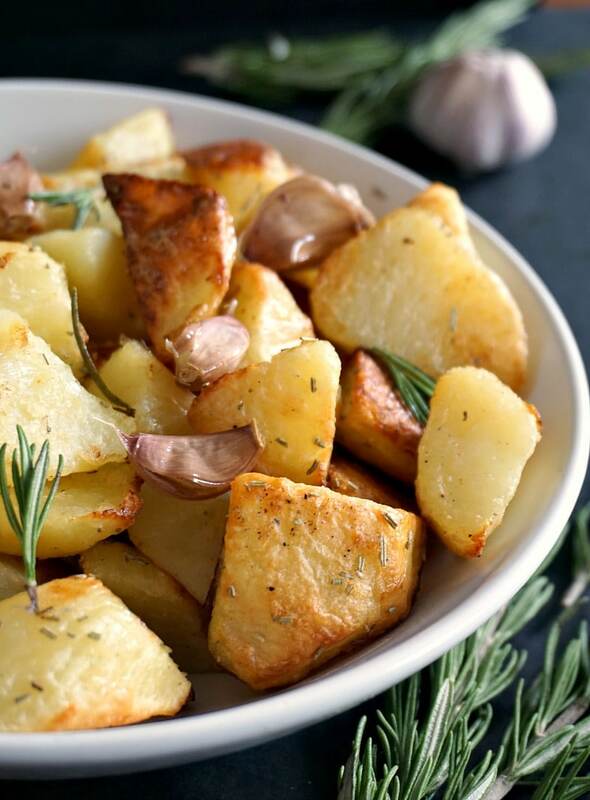 Forget about the dessert, these garlic oven roasted rosemary potatoes will definitely be the star of the night. I for one would gladly have another big portion. Looking for another great potato recipe? How about this Spicy potato wedges? They are awesome! Now, let’s eat! 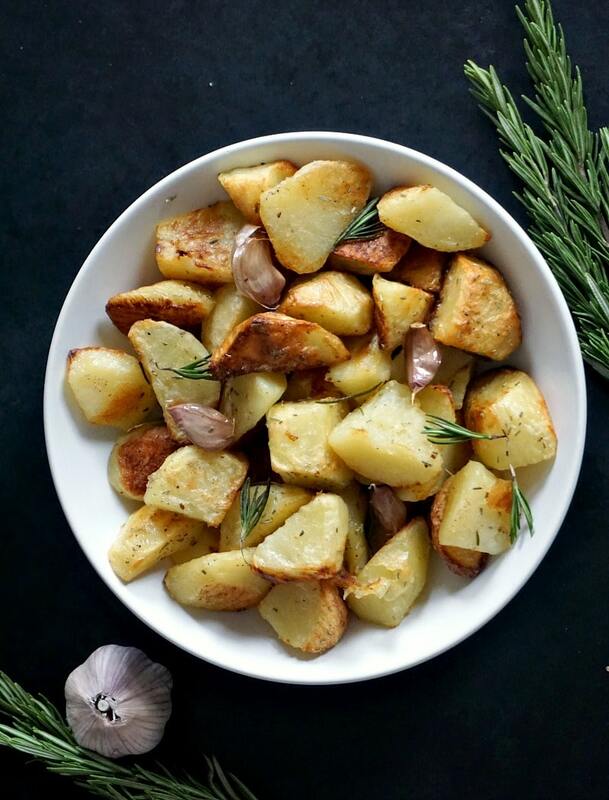 If you’ve liked my ROASTED GARLIC ROSEMARY POTATOES or any other recipe on the blog then don’t forget to rate the recipe and let me know how you got on in the comments below, I love hearing from you! You can also FOLLOW ME on FACEBOOK, and PINTEREST to see more delicious food and what I’m getting up to. 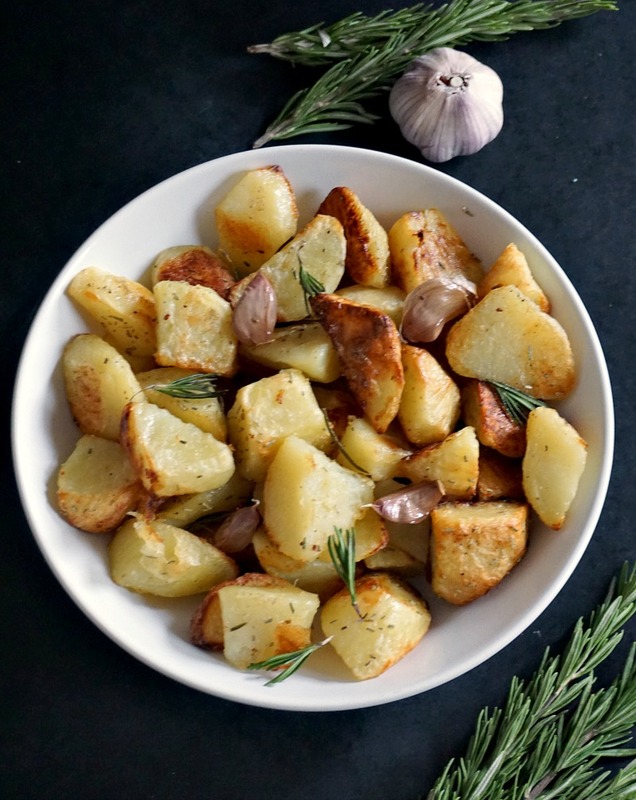 Oven roasted garlic rosemary potatoes, a side dish after my own heart. Are you looking for the best side dishes for the Thanksgiving dinner or the best side dishes for the Christmas dinner? Well, here you have one of them. And if you want to take that Sunday roast to a whole new level, you need to follow a few, very easy steps which will guarantee a smashing success. Peel and cut the potatoes in big chunks, then pre boil in water with a pinch of salt for 5 minutes. Drain the water and give the potatoes a good shake, that will help the potatoes become crispy on the outside and soft on the inside. Drizzle the olive oil onto a baking tray and place in the oven for at least 3-4 minutes so that the oil can get hot. Remove the tray from the oven, place the potatoes and give them a good shake so that they can be coated with oil. Scatter the garlic cloves and rosemary onto the tray, and roast in the oven for one hour until golden. They look like perfect roast potatoes – a lovely, golden colour and nice and crisp. Thank you, Millie. I did get the other comments too, many thanks. YES. I could eat roast potatoes every meal of the day. These look amazing! Thank you very much! I do agree with you, roast potatoes are just lovely and could eat them anytime. I love the rosemary in these potatoes. One of my favorite dish! I’m a little unclear on the rosemary – it doesn’t look, from the photos, like there is chopped rosemary on the potatoes. Do you just strew the sprigs about over them when they go into the oven, and remove after baking? Thank you for your comment. 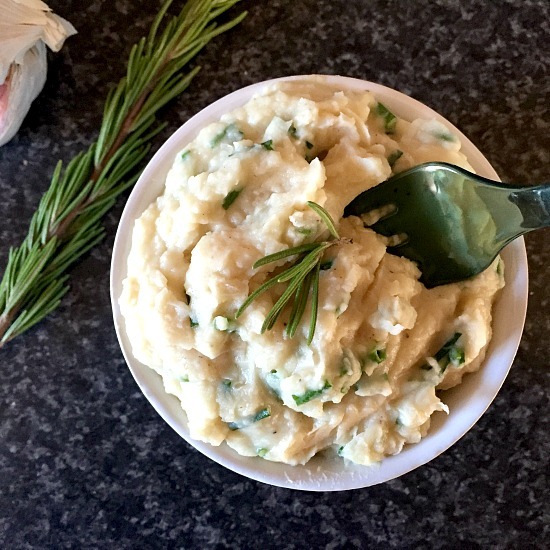 If you use fresh rosemary, you can throw the sprigs between the potatoes while baking and remove after, the flavour is quite strong and the potatoes will get that unique rosemary flavour anyway. If you use dried rosemary, just sprinkle some over the potatoes before popping them in the oven, no need to remove after. As far as I am concerned…they are never too many ways to enjoy delicious potatoes. These sound wonderful, and would be the perfect side to meals from brunch to dinner. Thank you, Gloria! Indeed, potatoes are yummy no matter how they are cooked. I love these potato recipe. Not only is easy but perfect to serve as a side dish at a special occasion or a weeknight meal! That rosemary addition yum!!!!! Wow this oven roasted garlic rosemary potatoes are the bomb. I love roasted potatoes a lot and make them often yours looks just perfect. 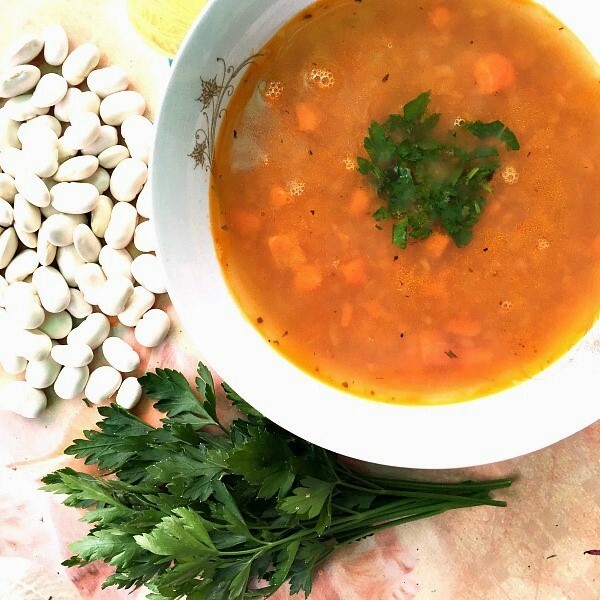 I love a good, easy recipe like this. I could eat roasted potatoes everyday! I bet these are so delicious, Daniela. Happy Fiesta Friday! These are a favorite way to cook potatoes – always a good side for so many dishes. This is a perfect side dish recipe! and the pictures are beautiful! The potatoes look just like the way we prefer — crispy on the outside and tender on the inside. Oh, yum!! We love our potatoes with garlic and rosemary — an excellent combination. Roast potatoes are a definite on (especially) Sundays in South-Africa as well.Love the addition of garlic and rosemary you have here ! I love this recipe, it’s my favorite way to make roasted potatoes! I made these twice in the last few weeks, love them so much. Shaking them up gets them all gloriously crispy, mmmm. Thanks for bringing these yummy potatoes over to Fiesta Friday, Daniela! Roasting potatoes is the only way that I make them. It’s easy! Rosemary and garlic go so perfectly together. I bet it’s delish with the potatoes. Thank you! They really are nice, even for fussy eaters. These sound delicious. I love rosemary and garlic together. Do you recommend reheating in the oven or the microwave for these if there are any leftovers? Thank you, Amy! Definitely oven, so the texture can be the same. Microwave would slightly change the texture. What a beautiful post, you’ve definitely got the British style roast potatoes down! I absolutely adore them with garlic and rosemary too and the crispiness you’ve got on these is mouth-watering! 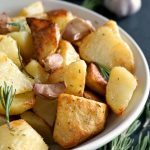 Roasted rosemary potatoes looks delicious I love this easy version of potatoes. 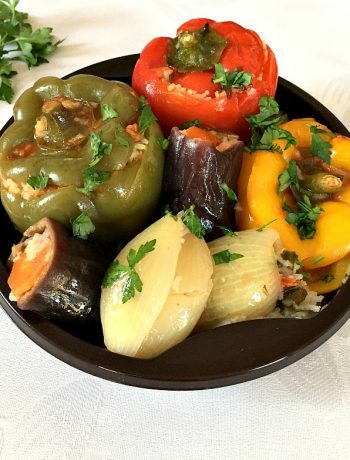 They make perfect side dish with lot of flavor .